Love is decidedly not in the air at the White House—mere days after Vanessa Trump ripped out Donald Trump, Jr.’s lion-killing heart and fed it to her attorney, it’s been revealed that the wife of Dan Scavino, Trump’s assistant and Twitter enabler, filed for divorce in January. On the bright side, Don Jr. has someone to watch A Night at the Roxbury with on repeat until the pain goes away. According to the Huffington Post, Jennifer Scavino filed for in Dutchess County, New York, in January. She and Dan Scavino have been married since September 2000 and have two children. The cause of divorce is not clear. 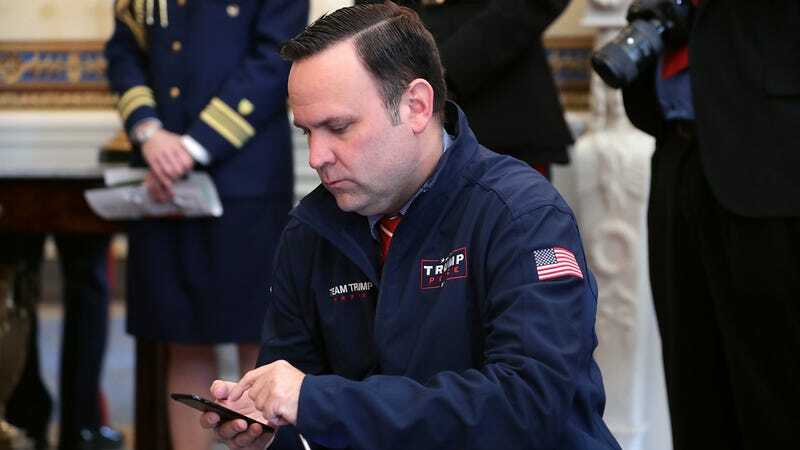 Unfortunately, it appears Scavino will no longer be able to use that excuse, and will instead have to rely on Roy Moore’s attorney to earn points with members of the Tribe. The good news is, Don Jr.’s also single and breakups have strength in numbers, though I do weep for Washington, D.C.’s bar scene.